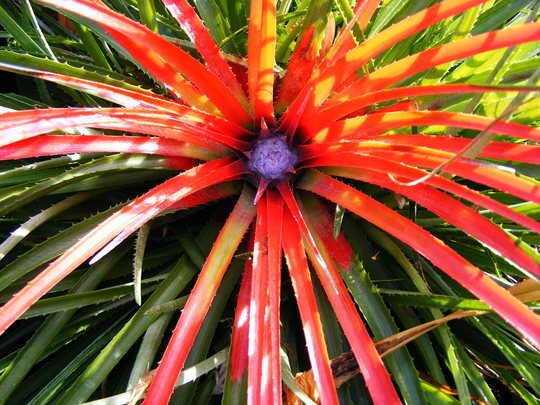 exotic garden plants : Fascicularia flowered, YAY.. Thanks everyone, it has several clumps like this but this is the only one to turn red and flower, pretty good considering the weather! I thought you had one Mushy? how wrong am I lol..
reminds me of a firework,amazing. Yeah Suey like a firework and it really is that bright, if the flower gets a chance to grow bigger its an electric blue, Amazing..
That is amazing love the colour, how long has it taken to flower? and do you keep it in a pot outdoors, and bring it in? Thanks Clarice, I am pleased Sandra, now i want the whole plant to turn red and flower lol..
DD, I dig it up put it in a pot and put it in the unheated Greenhouse, Its pretty hardy and i know some leave them out for winter but im not chancing it..
Wow.., first time seeing one of these ! It's incredible..., I want one...!!!....lol. Dee that is fantastic, I want one.!!!! !